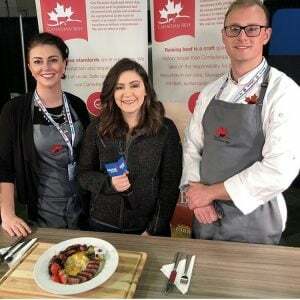 The Canadian Beef Centre of Excellence (CBCE) team of Chef Cameron Pappel and Rachel Peters were on the main food pavilion stage at the Canadian Western Agribition in Regina November 19-24, showcasing the hidden gems of Canadian beef. 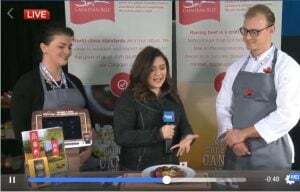 The goal of the cooking demonstrations was to encourage consumers to think outside the box when picking up beef at the grocery store, and beyond the realm of the usual cuts they purchase. The team interacted daily with hundreds of guests through their demonstrations, and their on-site retail meat case. 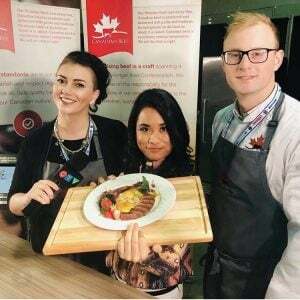 While on site, the team also garnered a large amount of media attention, and both Global and CTV television approached the pair for live on-air segments to share with millions of Canadians across the country. The demonstrations and the TV appearances also encouraged a flurry of social media attention from food bloggers, media personalities and socially engaged consumers. 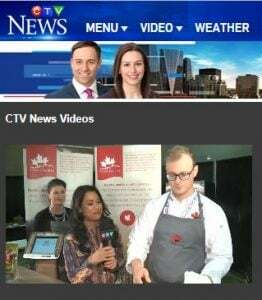 The CBCE was also pleased with the amount of producer traffic at the event and engaged socially, which ensured that Saskatchewan producers were able to see their check-off investment in action through the CBCE.